What Are The Purposes Of Truck Scales? Truck scale is a weighing object that is also known as railroad scale. The main purpose of this weighing machine is to weigh the entire road vehicle both when loaded and empty. In the process of weighing uses the key component that is a load cell. The main role of this key component is to weight measurement to use a weighbridge. 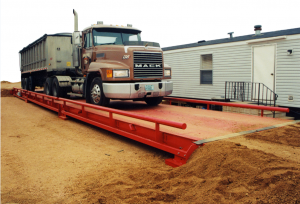 In the term of truck scales, a weighbridge has two part platform that is at a gravel pit. That platform is a space area over which trucks are driven. The whole process of is using electronic measurement tools and objects. In heavy industry or any other, businesses owners are used to heavy road vehicles for import as well export their business products. They all use commercial trucks for their business purposes. Measure the weight of those commercial trucks is a part of the business. This is all about profitability that means goods and products are largely dependent on weight. There is another reason for weighing truck is calculating taxes on the loaded truck. If they have personal commercial trucks of vehicles then they will pay road taxes otherwise truck owners have to pay because this is legal and compulsory. The whole collection of taxes on the road is used to maintain the road for our safety purpose. There is the biggest reason for weighing loaded vehicles i.e. safety concerns. All road vehicles are not the same and cannot carry the same load. The capacity of loading depends on the vehicle. If you will try to put overload than the capacity of the vehicle then it can cause many problems during the drive. So the safety purposes it becomes compulsory to weighing road vehicles. Those road vehicles have more values in industrial scales. If you want to get more information than you can get from the internet.